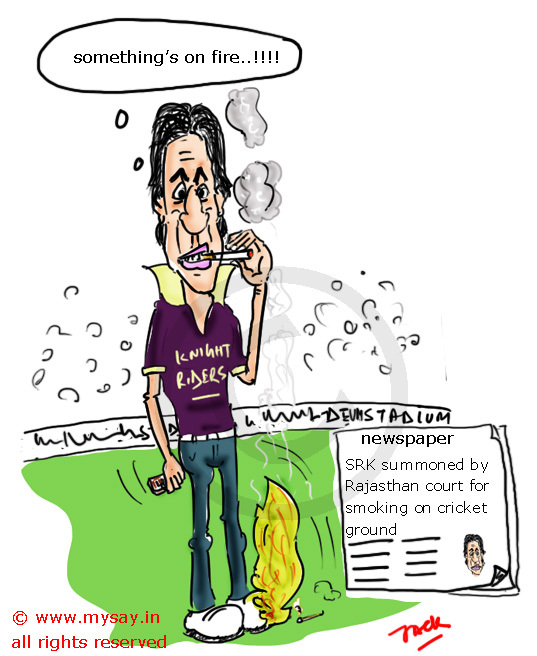 Shah Rukh summoned by Rajasthan Court for smoking on IPL ground! Smoking publicly is banned in Rajasthan since 2000 under the Rajasthan Prevention of Smoking Act. However, Bollywood ‘Badhshah’ and owner IPL Team- Kolkata Knight Riders,Shah Rukh Khan was smoking publicly in front of thousands of spectators.on the ground and on Television, while watching the IPL match between Rajasthan Royals and Kolkata Knight Riders on April 8th at the Sawai Man Singh Stadium , Jaipur. Dude, I like the direction your art is going. thanx for the appreciation and support,Aaron!